An illustration of a 'Smooth' Blenny (a fish with a slightly elongated body), viewed in profile, facing to the right of the sheet. Below it; to the right, is a head-on depiction of the fish; and to the left, is a close-up of its mouth. The sheet appears to have been removed from a volume. A watermark featuring a trefoil design is visible to the right of the illustration. Plate number, top-left corner of plate impression. Bottom-right corner of plate impression. A watermark featuring a trefoil design is visible to the right of the illustration. 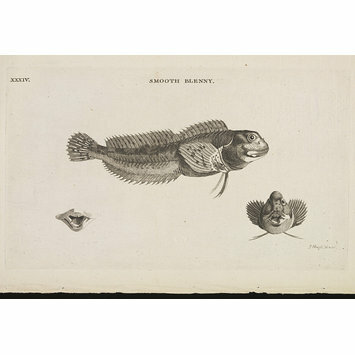 This is one of a group of 18 illustrations of sea creatures (see objects 29638:186 to 29638:203) that appear to have been removed from the same volume. They all have plate numbers, running consecutively from XXVI to XXXIX and then XLIII, XLIV, XLVI and XLVIII. 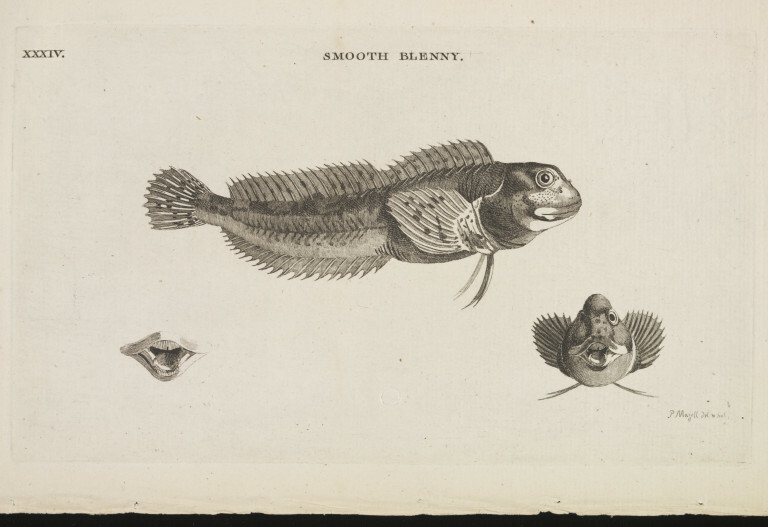 'SMOOTH BLENNY.' viewed in profile, facing to the right of the sheet. Engraving print on laid paper. Drawn and engraved by P. Mazell. 18th-19th century. P Mazell del & scul is inscribed in the bottom-right corner of the plate impression. This could possibly refer to Peter Mazell (active 1761-1797).